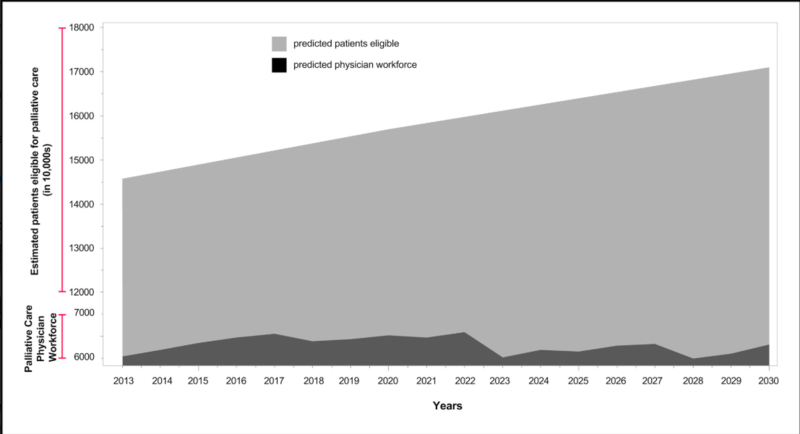 Future of the Palliative Care Workforce: Preview to an Impending Crisis. Kamal AH, Bull JH, Swetz KM, Wolf SP, Shanafelt TD, Myers ER. Am J Med. 2017 Feb;130(2):113-114. doi: 10.1016/j.amjmed.2016.08.046. Epub 2016 Sep 26. A new bill, the Palliative Care and Hospice Education and Training Act (PCHETA) is working its way through Congress. If signed, the act will improve the quality of life for millions of seriously ill patients and their families. It will lead to reduced pain and better coordinated care between doctors. In the practices and clinics that are part of this Supportive Oncology Collaborative, we have seen first-hand how supportive care delivered by a multi-disciplinary team that includes physicians, nurses, social workers and chaplains, benefits patients and families. While the #PCHETA bill is necessary to solve the long-term workforce shortage, The Coleman Foundation has been supporting efforts to improve the workforce trained in supportive cancer care and palliative medicine in the Chicagoland area. The Coleman Supportive Oncology Collaborative created these sixteen online courses that care teams anywhere in the world can use to improve their skills. There is no charge for the courses, and they can be taken for CME credit through the NCCN website. Course offerings are listed here. Another Coleman Foundation Initiative is the Palliative Medicine Training Program (PMTP). Through mentorship and training, the PMTP is increasing the workforce trained in palliative medicine across Chicagoland medical centers and hospitals. Palliative care is also necessary for all seriously ill children. In this article, Palliative care for the living — more education is needed, pediatricians Drs. Angira Patel and Kelly Michelson refer to The National Consensus Project for Quality Palliative Care description of palliative care as an interdisciplinary approach to “patient and family-centered care that optimizes quality of life by anticipating, preventing, and treating suffering.” The definition says nothing about death and dying. The physicians are both affiliated with Northwestern University’s Feinberg School of Medicine and on staff at Ann & Robert H. Lurie Children’s Hospital of Chicago, both institutions are members of Coleman Foundation initiatives. In the article, the Drs. use the example of a patient diagnosed in -utero with heart defects who will likely face a lifetime of complications and surgeries. They suggest that introducing the Palliative Care Team from the start helps families and patients through their journey of decisions, specialists, and overlapping conditions. #PCHETA will help close the gap between patient need and care available. Already we are grateful for the work that the bill is doing to introduce the conversation about Palliative Care and Hospice and to educate providers and patients alike about Palliative Care.